Are you buried in emails, daily firefighting and unending meetings as you struggle to bring products or solutions to market? 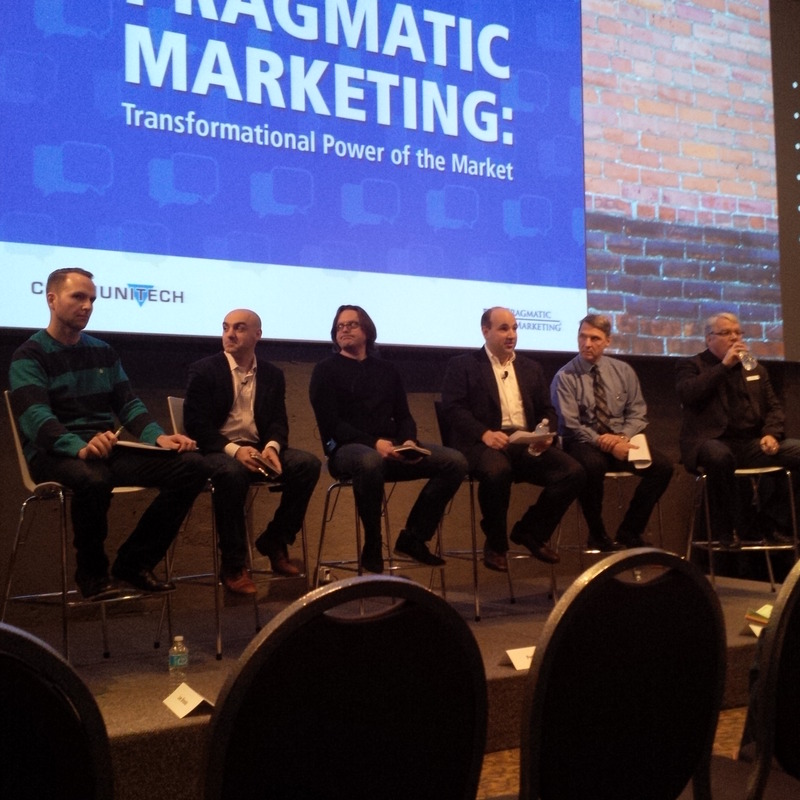 Communitech and Pragmatic Marketing join forces to present an in-depth panel discussion about the common challenges faced with bringing products to market. You’ll learn how focusing on the market drives better decision making, stronger innovation and smarter teams. You’ll discover how to navigate through these common challenges, conquer the status quo, and become the voice of your market, all while transforming your company, your career and yourself. Our panel was moderated by Paul Young of Pragmatic Marketing, who was in town to deliver the training. The event advertising worked, as more than 100 people showed up to hear what we had to say! Bill kicked things off by introducing Paul, who spent about 20 minutes presenting a case study of a product manager who had turned his company around and experienced a significant boost to his career in the process. One of the main messages of this short segment was that sometimes being market driven means not building the wrong product, rather than always building the right product. For companies, building the wrong product can consume enormous resources and months or years of effort, so avoiding these mistakes is important. Then, it was panel time! I’ve written a bit about panels before, and I always enjoy them. I was really genuinely looking forward to this one. One thing I had to keep in mind, though, was that while the other participants have several companies’ worth of experience under their belts, I was largely drawing on a single company. This reality meant that I had to take particular care not to present anything in a negative light, even if my intent was to show how we had overcome some challenge. I also made certain to clearly distinguish between when I was speaking from personal experience, and when I was relaying experiences of others. Hopefully I found the sweet spot of being very open and useful to the audience without painting an unfair or negative picture of my experiences. Paul did us the favour of sending around potential questions in advance, so that we could give some thought and provide more complete answers than if we were simply put on the spot. Below, you’ll see the answers that I prepared, and some of the notes I took while the other folks were giving their own take. When it comes to bringing products to market, what challenges do see companies running into over and over again? Why? To expand a bit: companies need to go beyond just their lead customers in order to find out what non-customers and prospects need, and they need to have the self-awareness to genuinely determine if the product timing is right. Furthermore, the internal development processes must be in place to deliver on time, before the window of opportunity closes. One challenge that I’ve seen companies encounter is that it is very hard to turn attention to unproven markets (the devil they don’t know) and consciously ignore (or at least look beyond) some of what your lead customers are saying. As companies grow beyond the start-up phase and try to cross the chasm, this challenge is especially prevalent. Bill explained that one challenge he sees is that companies often bring out incomplete solutions that don’t fulfill what a customer really needs. George explained how a lack of data can lead to mistakes, and how we can go about becoming more data-driven. What barriers are preventing us from being market-driven today? How should we overcome those? Over the years, I’ve observed that many technology companies are dominated by either engineering or the sales organization, and neither of those groups is inherently market-focused. Engineers often want to build the coolest, most complete solutions to the hardest problems, and this can result in overly complex products that are not timed appropriately or miss the window. This phenomena is a classic example of inside-out thinking. There are lots of good ideas, but to capitalize on them and make the right decisions your engineering team needs market data and exposure. The problem with sales-driven organizations is a bit more obvious: they pursue this quarter at the expense of next year, and are easily influenced by supposed big deals (that often don’t materialize). If sales and marketing report into the same executive, then that executive has to be very strong and disciplined to separate the potentially conflicting short- and long-term objectives. As an organization, you must focus on building market-driven solutions for problems that are pervasive, urgent, and valuable (in the sense that people are willing to pay to get a solution). “Outside-in” has to be a mindset that permeates the entire organization; having a team or two being market-driven (generally) isn’t enough, because they will run into opposition and skepticism. The question then becomes, how does an organization develop this mentality? It can start by getting more people outside the building and talking to customers. You have to also honestly ask yourself why people are, or are not, buying your products (win/loss analysis). Next, all of this information and insight has to be shared, and has to be used to build commitment from all parties. Where do you see breakage between groups inside of companies today, and how can we address that? Have unifying, company-level objectives that then trickle down into individual departments…but, and this is the critical part, actually track and act on them. How many times have you been part of a big initiative that produces clear objectives that aren’t examined until 11 months later, when it’s time to restart the initiative for the next year? We have to measure as we go, so that we can course-correct. Foster more casual conversations…not agenda-based meetings! Bill talked about trust, between everyone in general but primarily between the product manager and the engineering/development manager. He explained how when he’s in a new job or working with a new person, he starts off with a casual, but open and frank, conversation about how they should work together, including a three strikes policy. What are some of the challenges you’ve faced within your functional areas in getting products to market? How could product management help there? The biggest challenge for me is the occasional nasty surprise: we’ve perhaps planned launch messaging, build sales tools, and even planned tradeshow themes around features and dates that then change. Thankfully, I can’t recall any recent examples where this was the case, but effective launch planning and support is a massive endeavour, so if something is at risk of slipping out, then I want to know about that risk. How do the challenges of product development differ at a start-up vs. an established company? In a start-up, there’s typically greater alignment and focus (the focus might shift, as companies adapt and react, but focus is typically applied to fewer things at any one time). Start-ups benefit from having smaller teams and enormous interaction, with people often right on top of each other. As a company grows, the challenge becomes avoiding putting too much focus on the lead customers and missing out on the rest of the market (e.g., prospects, competitors’ customers, evaluators, etc.). You also have to transition a bit from building a minimum viable product and instead building market-ready, hardened products. In a bigger company, focus can be a bit of a challenge as you see many opportunities or look to continue strong growth by expanding into new markets. You can also run into challenges of having key resources that are needed on many projects at once, although this can really happen at a company of any size. George had a good line about companies falling prey to “the tyranny of the urgent”. So true! What should executive teams do to create a culture of good product development and listening to the market? If you could wave a magic wand and change one thing at your company tomorrow, then what would it be, and why? I’d like to continue our (substantial!) progress in creating that company-wide outside-in thinking. When we’ve practiced this outside-in approach, the results have been great – we’ve spotted opportunities, gotten the jump on competitors, and taken calculated risks – when we’ve fallen into the trap of thinking we have all the answers, then we’ve had some post-launch surprises. The other panelists build on my answer by adding how they would go about creating or capitalize on this outside-in shift. I really did have a blast, and I’m repeatedly amazed at how quickly panels fly by. We were up there for 45 minutes, and it felt like 20. 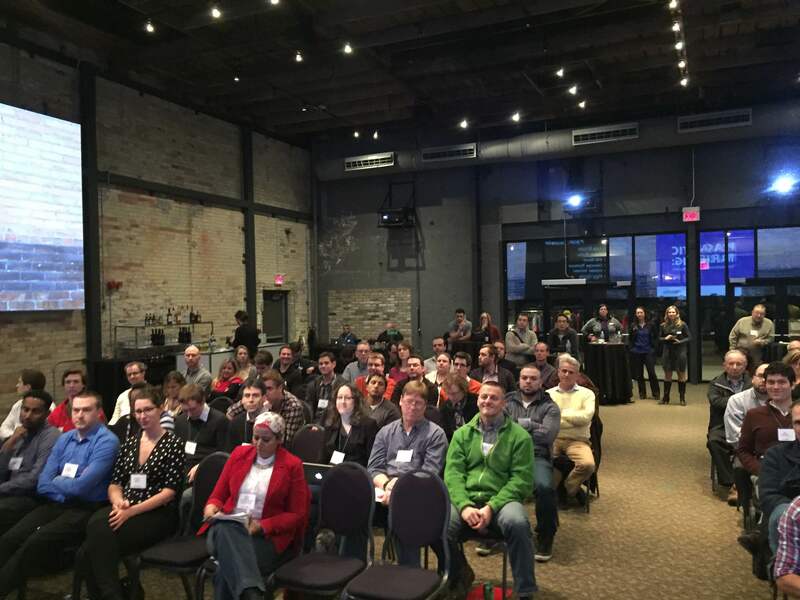 Thanks to Communitech for hosting this event, and especially to Cristina Burca, Kristen Gillett, and April Philpotts who bore the brunt of the planning and execution!